The Science Express Exhibition special train, an initiative of the union ministry of science and technology is a special train which aims to create awareness among masses in general and youth especially the students in particular about the exceptional biodiversity of India & about various issues & challenges associated with Climate Change and how it can be combated through mitigation and adaptation. It also serves as a momentum to the Paris climate summit which is building up across the globe. It was flagged off jointly by the Union environment minister Prakash Javadekar, railway minister Suresh Prabhu and Science and Technology minister Harsh Vardhan on 15th October, 2015. It is the third phase of Science Express Biodiversity Special (SEBS). The train is covering 57 locations on Broad Gauge network of Indian Railways across the entire length and breadth of the country. Of the 16 coaches of the Science Express- Biodiversity Special, 8 are solely dedicated to showcasing the myriad biodiversity spread across all the bio-geographical zones of India, case studies and material related to various aspect of climate change, the underlying science, impacts, adaptation activities, mitigation solutions and policy approaches in a manner that is easy to understand and interesting for not just school students but also for the masses. It would make people aware of the implications of global warming and the measures which may be taken at both local and national level to tackle the common threat. 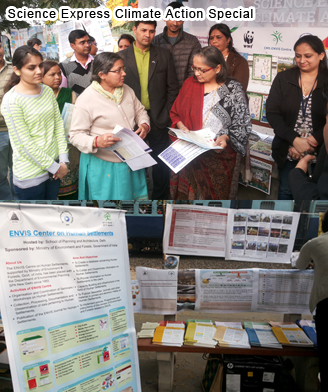 The Delhi based ENVIS centers facilitated the exhibition at the Science Express Climate Change Special (SECCS), from the 6th to 8th December, 2015 at Pragati Maidan by highlighting their respective activities. Each centre had showcase their respective activities by putting up take away Posters, Pamphlets, Newsletters, and several other educational products at appropriate places on the platform for creating awareness among the school students, teachers and general masses about ENVIS Platform and types of activities performed by them. The event was a big hit among a large number of students from many reputed schools across Delhi and NCR like Titiksha Public School, Modern Day Public School, Greenfields Public School, Kendriya Vidyalaya etc., as they gathered in large numbers to explore the Science Express. The event also witnessed a large number of families who had come along with their children to enrich their knowledge about Biodiversity, Climate change and its impact on our Environment. The ENVIS Centre on Human Settlements mainly emphasized on Climate change & Smart Cities Concept. This unique mobile exposition was initially launched on October 30, 2007 by DST, in collaboration with German government and Max Planck Society and it travelled across India in 4 phases of 6-7 months duration each. In 2011, as a joint initiative of DST and then ministry of environment and Forests, Science Express was rolled out as 'Biodiversity Special'. It has become the largest, longest running and most visited mobile science exhibition and created several records in its wake, including six entries in the Limca Book of Records. Coach 1 - Understanding climate change: The physical science of climate system, climate change - its causes and history - and industrial revolution and concept that all systems are connected. Coach 6 - Mitigation-India's action: Various national, state and local level action and adaptation programme implemented by India and how those are linked with national strategies and international actions. Low carbon strategies, ambitious goal to increase RE. Coach 7 - International negotiation on climate change: Introduction to UNFCCC, IPCC and internationally agreed action and targets. Explaining concept of equity and common but differential responsibility, Polluter pays Kyoto protocol and other key outcomes of major COP, etc. Introduction to Intended Nationally Determined Contributions (INDC). The rest of the coaches will have exhibits on themes like Wildlife and Nature Conservation work being carried out by different research institutions across India with focus on Tigers, Turtles, Coral Reefs, Amphibians, etc. besides development in field of Biotechnology, Innovations in S&T, Science Education, Schemes of DST, Careers in S&T, and so on.